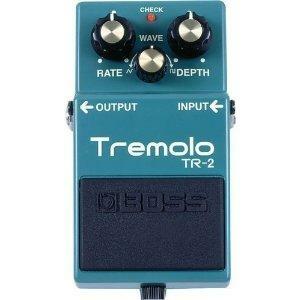 Tremolo Pedals vary the volume of a signal over a user defined period of time. Quite often, these devices have additional functionality that can control the specifics of the volume increases and decreases. The video below is a good demonstration of a tremolo pedal that has this functionality. Most tremolo pedals have rate & depth controls, along with a control that tweaks the specifics of the volume increases and decreases; this is often labeled as a "wave" button. The reason for this is the increases and decreases in volume can resemble the pattern of a wave, or other recurring patterns....like a triangle, for example. The rate button adjusts the speed of the volume "changes", i.e. how often the volume increases and decreases. The depth is typically the strength or intensity of the effect. If you want more tremolo effect, turn this button clockwise. Vibrato is the slight alteration of pitch over time, commonly associated with the human voice. Vibrato pedals are designed to take a guitar signal and reproduce this phenomenon. Like tremolo pedals, vibrato pedals have speed and depth controls. The speed button controls the time between the altered pitches and the depth represents the amount of difference between the original pitch and the altered pitch.